Goodbyes Part 5: Friday- Oh Captain, my Captain. This morning Mr. M gave me a replica of a famous Baekje dynasty era incense burner as a going away present. Yesterday he told me that he was sad that I was leaving, and he thinks of me like a daughter. He is super sweet. Today was difficult. Is difficult, really, because though I’ve finished my classes I’m not done with my goodbyes. Today is also my last day at hapkido. I taught class 1.2 in the morning (low-level, 1st grade, all boys, approximately 25 students). They’re good kids, and they try reasonably hard, but I don’t have a super strong bond with them as a class. The class I was really fretting about teaching was class 2.1, during third period. Class 2.1 (advanced, 2nd grade, co-ed, approximately 30 students) is the first class I really got to know student’s individually in, because the students in my lunchtime conversation club were all from this class. I don’t even know what to say about this class – they’re amazing. I’ve rarely had discipline problems, and normally it’s just that they’re too high energy and won’t stop chatting or shouting out English answers. This class has IMYSM(e), most of my pop-song contest girls, my host sister, and it seems like every person in there is a character. I knew they would be the hardest to say goodbye to. I’ve always put a disproportionate amount of work into 2.1’s class compared to the other classes. I write one lesson plan for most of my low levels, one for the two intermediates (though sometimes the intermediates do the lower level lesson), but class 2.1 always gets its own lesson, and I normally only use that lesson plan one time. It’s not that I don’t work hard on the other lesson plans, it’s just that I spend a few hours on one lesson plan that I can use for four or five different classes, but then spend the same amount of time on the lesson plan that I’m only going to teach to 2.1. However, there’s no other class at the school that’s really anywhere near their level – their speaking and comprehension is really good, and they’re so motivated and so enthusiastic that I haven’t wanted to just teach them a more difficult version of the intermediate lesson and lesson planning for them has actually been a joy. I tried my hardest to make lessons for them challenging, but enjoyable and ultimately useful. In class we wrote poetry, made up protest chants, and debated the ethics of who should be left behind in a burning building. Every class was speaking intensive. I knew that this was going to be the hardest class for me to say goodbye to, and also I think the class that has grown the most attached to me as well. This class I normally teach in the English room instead of their homeroom, but 10:30 rolled around and no one was in the classroom. A student came up, got me, and told me to come to their homeroom instead. 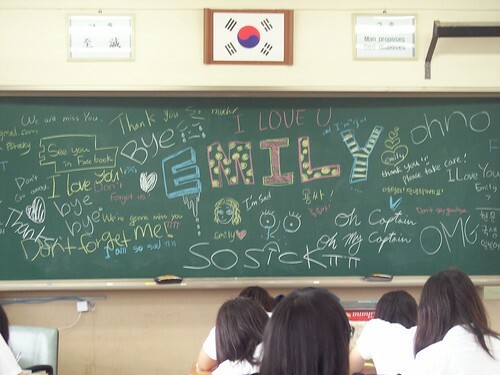 I got there a bit too early and came through the back, so they weren’t ready, but they had written phrases all over the board (my personal favorites being “I love you – and I’m a girl!” and the Korean words for “adjective” and “noun” written the way I normally say them – i.e. wrong). They had also made a chocopie cake topped with a candle made of paper that they asked me to blow out. At the end of class, the students started standing on their desks and chairs, and then one of them (“Changyeonce” as the other students call her – “Chang” being the first half of her name, and “yeonce” being a reference to how she’s like Beyonce. She’s a member of my pop-song group) screamed “Oh Captain, my Captain,” a reference to Dead Poet’s Society. 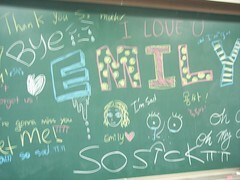 I can’t tell you how moving that was, especially if they think that I’m on par with the teacher in that movie. Most of the students stayed after to talk to me even after the bell for the next class had rung, meaning as a class they were late for gym, and I got attacked by individual students hugging me, telling me not to cry, one of them crying herself, and wishing me good luck. They also gave me two pieces of paper decorated with messages in Korean and English from all of the students in class 2.1. I then ran to the bathroom and burst into tears right before I got there. Today I taught class 2.1, my advanced class. I Miss You So Much(e) Boy came up to me with his man-possee, who proceeded to tell me that IMYSM(e) was just like TOP from Big Bang. I told them they were wrong, because TOP has ridiculous hair, and IMYSM(e) has fairly normal hair. 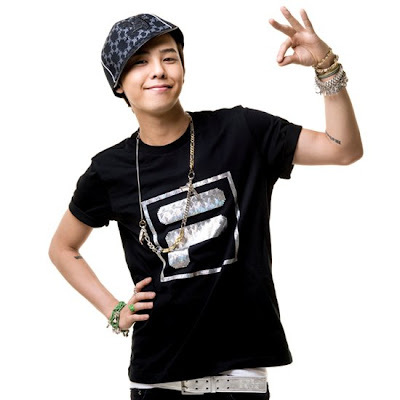 Then he told me that he was just like GD from Big Bang, to which I responded that GD was way more attractive. Then he said he wasn’t talking to me anymore, and all the boys in the class called me a heartbreaker. I think you should VERB. My advice is to VERB. I advise you to VERB. First I had them brainstorm problems that high school students commonly had. Of course, the first example was shouted out by IMYSM(e) who had promptly forgotten that he wasn’t speaking to me. Many of these problems dealt with issues with significant others (taught them the term SO today), studying, parents, etc. My personal favorite was “I am too handsome.” Oh man, such a problem. Then I gave them scenarios, and the students had to write advice for what to do if you were caught in that sort of a situation. My conclusions are that 2.1 class is full of BAMFs. If your SO cheats on you, you should _______. eat a lot of pizza, pasta, cake, ice cream. If there is a pop quiz, I think you should ______. write “I love you teacher” on the quiz. If you visit SGHS, I think you should _______. If a bear attacks you my advice is to ________. If your house catches on fire my advice is to _______. If there is a zombie apocalypse I advise you to _______. If I ever need advice, I now know I can count on class 2.1. I know I haven’t written in awhile… and I’m currently in the process of writing a nice long write-up about the epicness of my school’s Sports Day, but I have to break that for one of the nicest comments I’ve received from a student. Thursdays are my horrible days. I have my two worst classes back-to-back first and second period. In most of my classes my students are fairly low level but I don’t mind… while it does make certain aspects of classes difficult, it also makes me feel more needed and like I’m making more of an impact. However if a student can’t understand anything that I’m saying, that means that they really have to try and focus. There’s only so much I can teach, if my class is sleeping, constantly chatting, throwing socks, making paper airplanes, getting into fights and throwing each other into headlocks, or having screaming tantrums (this has all happened). I can deal with low levels, and I can deal with behavior problems, the issue is when students have both and also don’t respect me as a teacher. After that super special class I was on my way to my other difficult class which normally consists of 25 hyper-active first-grade boys (today they were practically catatonic, very strange. Also the computer was broken. Not missing, just broken) when I ran into one the “I miss you so much(e)” boy, who is one of my favorite students (I mean what? I don’t have favorites, hrum hrum hrum) and the class captain for my advanced second-grade class.